and then they took it down again saying "lolz sorry, this was due to a errorz hahah"
https://twitter.com/chris_carter_/statu ... 0784088065 was not impressed. A weasel hath not such a deal of spleen as you are tossed with! Mistake, or not, it hints at something happening. Text describing cloned products doesn't write itself. It has to have crept up the chain from somewhere it was being held in waiting. 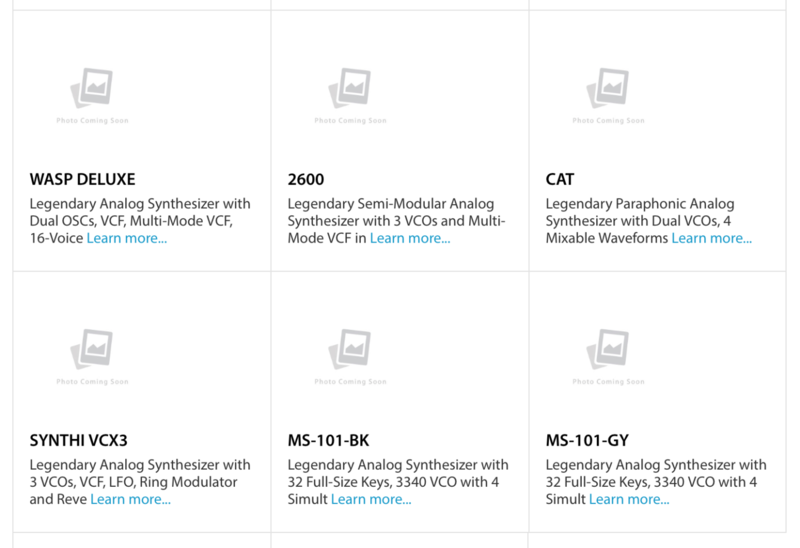 Whilst I have been critical of Behringer's batant plagiarism of contemporary gear, with that list the products are long out of production, with no chance of the original makers picking up the reins. For this reason I see no reason for the likes of Behringer to champion re-makes - and good luck to them if they do. I'd suggest someone from Music Group having a bit of drunken 'fun' after an enjoyable Christmas party. The Elf wrote: Whilst I have been critical of Behringer's batant plagiarism of contemporary gear, with that list the products are long out of production, with no chance of the original makers picking up the reins. Fair point. I was probably a bit hasty in my assessment. But then, I don’t count all that boutique, reduced polyphony, miniature keyboard ‘made for hobbits’ rubbish! Surely *someone* owns the intellectual property for them? I mean even the Mellotron is owned by someone these days. Behringer ... I mean, Music Group ... no hang on, this just in ... I mean MusicTribe ... is getting big enough to employ bigger, scarier lawyers. Isn't it still trying to get its paws on the "Oberheim" name? This latest stunt seems to be Uli's thing, from the self-proclaimed "Chief Disruptor". I, for one, welcome our new SinoGerman overlords. Does this mean Tom Oberheim will have to just call himself Tom Kenobi? Out of interest, did anyone get any grabs of the product pages? Do we know what products were mooted? VCS3, 2600, MS-20, Kitten and/or Cat, and I think I saw several '101' variants, perhaps just colours. Curiously, there was no mention of their already-shown Minimoog clone. Plus a FX box called Maelstrom (something like the FX section of the DM12/XR16 in a box). There may have been an SP1200 or LinnDrum, but I can't recall now. Interesting. I'm surprised nobody has done a VCS3 clone before. There were rumours that Korg wanted to do the 2600. And I think that they'd object to an MS20 clone. These are amongst ones I've seen mentioned, but I didn't get to see it first hand. "WASP DELUXE Trademarked by Behringer's MUSIC Group IP Ltd."
Owned by: MUSIC Group IP Ltd.
Dave B wrote: Out of interest, did anyone get any grabs of the product pages? Do we know what products were mooted? Ta very much. Interesting that the MS20 clone is a Eurorack module. That takes Berry into interesting waters! Always wanted a 2600, but was put off by a combination of high price and ARP's shoddy build quality - especially after owning a Pro Soloist and seeing how that was put together! Here's hoping that Behringer can solve both of these problems for me! I think it's luck of the draw Elf. I had 3 2600s and they were all solid bar the grey but I expected that.